This years Nittanny Ninvitational was another successful DA outing with the U17 boys playing in an all Canadian final. The 38 teams participating are the cream of the crop from around the eastern and northern US. 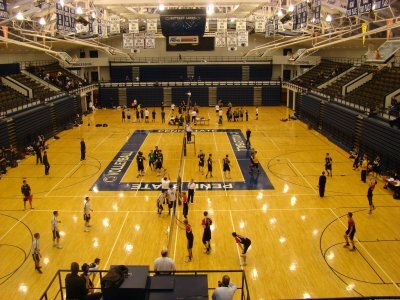 Four Canadian clubs, DA, MAC, Samurai and Crush made the journey to State College, PA to compete and to see Canada’s number 1 ranked Laval University play an exhibition match against top 10 ranked host, Penn State. Laval however, did not fair as well as the U17 contingent of Canucks. Pool play on Saturday morning started with a match against MVP – White that got the boys going on the right path finishing quickly 25-14, 25-10. In match 2 as DA got used to using the 12 unlimited substitution rule to their advantage, the opposition fell even faster 25-7, 25-9. The regular changes were held together by some great communication and incredible court sense from back court specialist, Alex Beckford coming in for power hitter Alex Dawson. Match three saw some changes in the line-up with right side specialist Jesse Gluck taking over the Libero duties while Jon Brouse was busy stepping in to give his setter a rest. The numbers continued to move in the right direction, even with a new setter, as the errors were reduced to eight in total, finishing off Victor VBC 25-6, 25-4. Match four in the round robin brought out the strongest opposition of the day as Warren Six pack brought their equally perfect 3-0 record with an eye towards getting the coveted first place pool finish. Chris Lam stepped back in to his setting position after a short rest and put on a clinic for the awestruck opponents. His mix at the net included quick’s, slides, backcourt, power, right sides, dumps, tandems…Chris quarterbacked the team to a close but clear 25-22, 25-20 finish to guarantee the position in the Gold bracket of the elimination round. Sunday morning’s late arrival was not a great start to the re-pool portion of the final day of competition but after dropping the first set 14-25 DA woke up with force. The Samurai from Longueuil Que. regretted waking the sleeping giant as DA’s 6’7” tag team in the middle, Trevor Grant and Alex Elliot repeatedly took advantage of the opponents weakness, scoring points on decisive attacks and calm, cool, collected blocks. DA sent the Quebec contingent away with a not so sweet taste in their mouth finishing them off 25-22, 15-12. The final match of the re-pool against Ultimate Blue was an eye opener for the boys in Black as they gave away more points than they earned and fell for the first time in the competition 16-25, 22-25. The Gold bracket elimination round started with a match against a confident Beantown VBC team that were looking to win a bid for the US nationals in Texas this coming July. They were however no match for the now warmed up left shoulder of offside hitter, the Kashwakamak Kid, Spencer Baron who executed repeated cross court kills against a block that could not adjust to his powerful left hand. 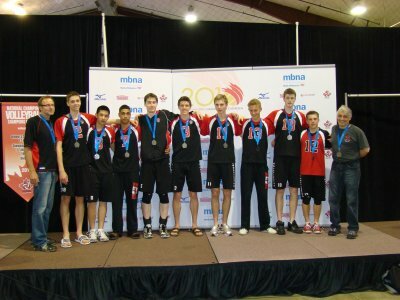 Quarter finals saw the boys striking gold, Ultimate Gold, from Chicago, last years 4th place finishers at the US junior Nationals. The memory of last years bitter loss to this team in the semi’s at the Rochester Can-Am tournament was still in their minds as Attack opened the match with a decisive kill from left side powerhouse Rob Wojcik. The match highlight reel is full of the incredible passing of the fleet footed libero, Jon Brouse. Jon brought a confidence to the court that the whole team fed on, helping them to a 2 set victory 25-23, 25-22 that finished they way it started with a decisive hit to the attack line from Wojcik. Semifinals required the best of all nine Durham players as they faced the very strong LIVBC, last years 8th place finishers at the US Junior Nationals. Set one saw a tired DA squad taking a quick lead then giving away far too many points on errors dropping the set 20-25. The second set rally to a 25-23 victory in the pivotal ‘middle points’ was a combination of the steadfast backcourt work of Gluck, Brouse and Beckford, the service of Lam and Baron, the front court control of the net by Elliot and Grant and the consistent finish from Wojcik and Dawson. The cross over in the third set had Attack down by 2, yet confident they could win the match. A kill from Wojcik and a stuff block from Grant evened the score and broke the confidence of the Long Island squad as Durham marched to a 15-9 victory and a place in the gold medal match. Match 10, sets 21 and 22 were the final of a long two day competition for DA and they faced their OVA rivals, Crush. The competition was strong but DA’s fatigue and unforced errors were the root cause of falling in two sets 17-25, 18-25 coming home with their heads held high and a silver medal finish in one of the top tournaments in the eastern United States. There were no hard feelings after the awards as the two teams joined for a spirited rendition of ‘Oh Canada’ under the red and white Maple Leaf. 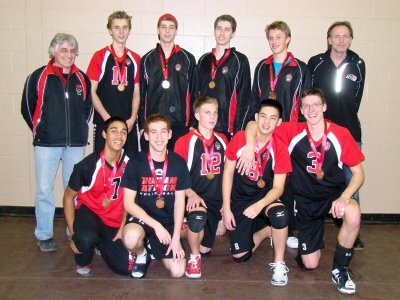 At the end of the 2008 season, the 16U Boys Black team had 12 players. This year the 17U team is down to nine players, three of them new arrivals. Despite the changes, the boys have quickly formed a strong cohesive team. 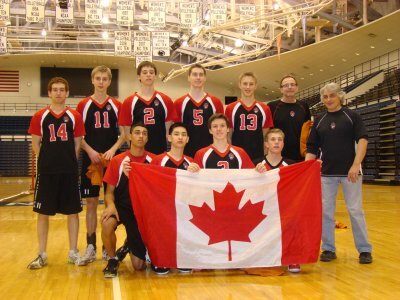 Playing in Tier 1 on December 12 in Hamilton the team came away with a well deserved silver after losing two close games against number 1 ranked Crush the final. On January 23 in London they put in another strong showing in the Tier 1 Premier Division, earning a bronze medal after losing to Crush in the semi-final, but beating the Breakers who had only lost one match all day. The team will miss the third OVA event because they’re travelling to the US to compete in a major tournament at Penn State on February 13-14. Best of luck boys ! !